Oblivion Taproom, 5101 E Colonial Dr, Orlando, FL. After reading about this place from a myriad of sources I totally respect, I took the leap of faith and went to a “taproom”. I thought I may feel out-of-place, but bravely I sauntered in and was warmly welcomed into a funky, cool, punk rock, edgy atmosphere. I am cool, but none of the rest..ok, maybe a hint of artistic funk. It was nothing and everything I expected. First off, the staff is completely amazing. Everyone from the Hostess, to the Servers, and the Manager that checked on my table were on-point. The décor was awesome, (the tables were far apart which I appreciate) you just felt special being there. There is a nice sized dining area, a bar, and an area with pool tables and darts in the back. They are known for their burgers, notably, The Hog Wild which seems to rate on many “Best Of” lists. They have a huge Beer list and also Cider list. Cray-zee! I ordered the Hog Wild Burger, rare, with Tater Tots seasoned with Salt and Vinegar. Also, naked Chicken Wings with Teriyaki on the side and homemade Blue Cheese dressing. A beer is a must in this place, so I got a Haider Weiss…light and incredible. I highly recommend it. The superior thing about Oblivion is there are many flavor choices available to you. Peruse the menu, it tantalizes the taste buds. Ok, the burger and wings arrive. Let us start with the wings. I like my wings naked, sauce on side if applicable, I don’t like breading. They were naked and golden, just like they had been to the beach all week. The teriyaki sauce was homemade and decadent; rich, with a slight kick. Like the majority of everything they serve, the blue cheese dressing was made from scratch as well. You could taste the pureness, so fab I dipped my salt and vinegar tater tots (done perfectly) in it and made magic! Best wings I’ve had in quite some time. Burger up! This is not just a burger, this is a freakin’ insanity burger! It should be called Holy Hog Wild because “holy” was the first word that slipped out of my mouth with my first bite. Listen to this….house smoked pulled pork, sharp cheddar cheese, caramelized onions, fried onion straws, house bbq sauce and house smoked bacon. Oh yeah, and it is all on a half pound chuck-brisket-short rib burger and in between a delectable brioche bun. You know it is a sublime burger when you don’t want or need any condiments on it. Have mercy! This smokey sensuously meaty burger will make you cry. It will make you wanna slap somebody, and then when you have gone home, it will make you yearn to return. A carnivore’s dream. Vegetarian options are offered as well. Nice, right? Check it out. 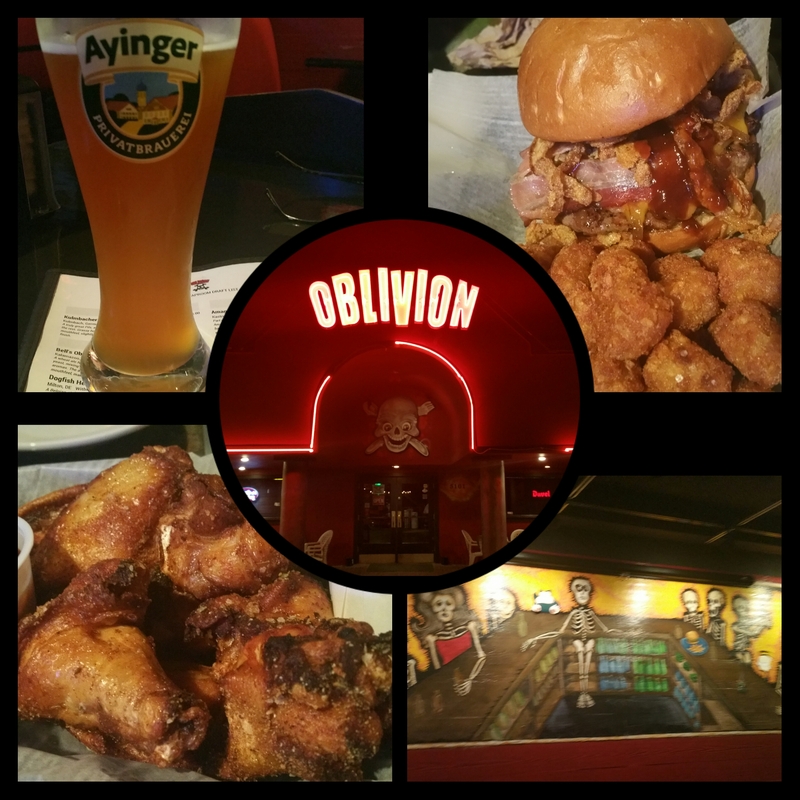 Oblivion Taproom offers its customers the best in food, drinks, rad atmosphere and staff. Damn, I am now obsessed. Hours: Tuesday – Saturday 4pm to 2am. Sunday 4pm to 12am. It’s a taproom, not a tearoom. Closed Mondays. Located just East of Downtown Orlando. 5 out of 5 perfect palate points. If you’re in Orlando and don’t eat here, you’re an idiot. That One Spot (Burgers by Design), 10968 W Colonial Dr, Ocoee, FL. Orlando metro area. Near the FL Turnpike and Hwy 50. If you’re a burger lover or consider yourself a burger connoisseur, you know that finding a damn good burger is hard to find. Either you can’t have it cooked the way you like, or the patty is too thin, the meat has no flavor, the price is ridiculous, or the toppings are the only thing that makes it halfway decent. Look no further, Orlandoans! That One Spot, Burgers by Design, will be thee spot for you. Burgers cooked to order, full of flavor, priced right….and by design! Yeeha! They have a nice menu, so I select the BB Burger. The beef patty is a custom blend of brisket, short rib, and chuck. It is topped with caramelized onions, melted cheddar cheese, pecan smoked bacon, smokey brisket, and finished off with their own horseradish sauce. I order mine medium rare with a side of hand cut fries and a soda. Yum. I can barely wait until it arrives! Da da da Dahhhh! This burger displayed in front of me, ooh tantalizing. I cut it in half and go in deep. Incredible. This is what I’ve been looking for, for a while. The beef patty was done to perfection, the flavor was rich and beefy, juicy, and delectable. The addition of toppings were fantastic. The tightrope walk of heavy meats and cheese, sweetness of the onions, and bright shot of horseradish sauce, made it a well-rounded bite. The hand cut fries were amazing and added a nice crunch. Living in Orlando, visiting, or on the Florida Turnpike…get yourself here. I mean it. I’ll be there trying another burger, maybe the Slaw Burger or That Other Burger. Whatever my choice, it’ll be dang fine! One of the best burgers in the Orlando area. Open 7 days a week 11:00am to 9:00pm. At the corner of West Colonial (Hwy 50) and Maguire Rd in the shopping center. 5 out of 5 bodacious beefy bites of perfection. Au Cheval, 800 W Randolph St, Chicago IL. After reading and hearing amazing things about Au Cheval Bar and Diner, it was my second shot at eating there, and I took it. In the freezing, dead of Winter, I was put on the waitlist for one and a half hours….with specific instructions. Don’t let the wait stop you. I would rather wait hours for fabulous, than 20 minutes for mediocre. Crispy potato hash with duck heart gravy, topped with egg….I couldn’t resist. A rusticly chic, warmly sophisticated atmosphere enveloped me, soothing me from the Windy City winter. Quickly the food arrived, and it was abundantly beautiful. 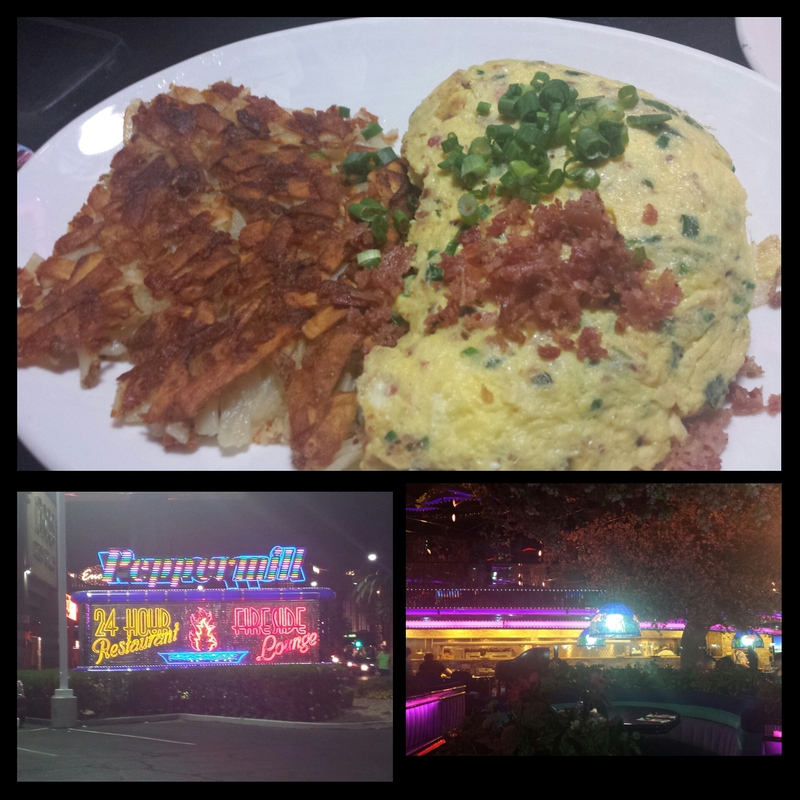 I first tasted the potato hash. The duck heart gravy was rich, meaty, and herbaceous. With mornay sauce and the broken egg yolk oozing throughout the perfectly done hashbrowns, I wanted to cry with delight. Ok Avery, step away from the dish of yumminess and dive into the burger. Upon first bite, OMGreatGoodness. I mean…just let me moan. This burger exceeded my expectations. 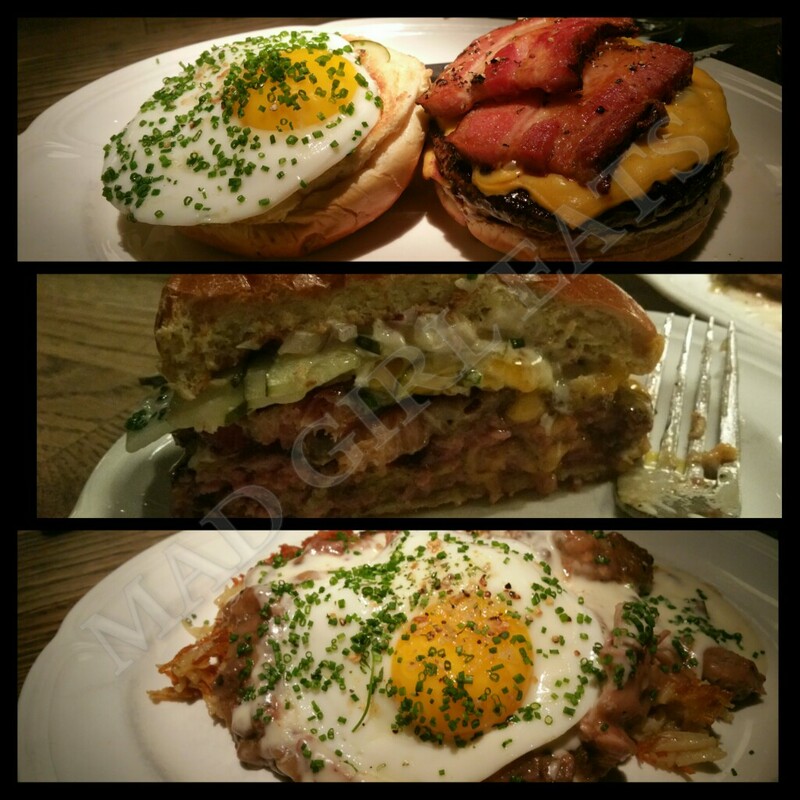 Superb beef, cheese….yada yada yada…the freakin bacon, and another ooey gooey egg brought a tear to my eye. I was leery because they only cook their burgers medium or well done, and I’m a rare girl. The medium did not disappoint and kept it’s outrageous flavor. One of the best burgers to date. Chicago does burgers right. Carnivore Heaven! Au Cheval, I love you. I’m intrigued to eat my way through your entire menu. Located in the burgeoning foodie area of Chicago’s West Loop. The Purple Pig, 500 N Michigan Ave, Chicago, IL. With the words “Cheese, Swine, Wine” emblazoned across the entrance of The Purple Pig, I knew I was in for a thrill ride of a meal! The menu is filled with tapas fare, original dishes, concoctions of the “wild” side, a perfect place to step into bliss… instead of the ho-hum ordinary. With a myriad of selections, I decide on the fried pig ears with crispy kale, pickled cherry peppers, and a beautiful sunny side up egg on top. Next, I dare to try their version of Chicago’s Italian Beef sandwich, made with pork heart and giardiniera. As requested, I received a tall glass of ice water and a lovely bottle of water also arrived. Nice touch, I do recognize and appreciate the details put forth. The first to arrive was the pig’s ears. To my delight they were cut thin and fried, and resembled onion straws. Hallelujah, they were an incredible edible! The kale was crunchy good, the pickled cherry peppers had just enough vinegar to cut the richness of the rest of the dish. They bring you a large fork and spoon to break the egg yolk so it oozes all over, and toss it around a bit. Dang. The flavors and textures just sung in perfect harmony. Man, did I love this dish! I was leery of the heart, but upon arrival it looked pretty damn tasty! Shaved pork heart (deli style), superb veggie giardiniera, all on an astounding crusty bread. Wow. I thought it may be minerally, or have a barnyard flavor, it didn’t. It actually tasted like corned beef. Delish! I can’t swoon enough over this place! The menu, food, décor, service, ambiance, and it’s surroundings were spectacular in every way. I only hope I can return and try more creative delights they have to offer, sooner than later. The Purple Pig will definitely be added to my “Best Of” list. Brava! 5 out of 5 perfect piggy points.